Windows Vista compatible PC 32/64 bit; 35MB free disk space; Internet connection for product activation of TweakVI Premium and Ultimate. Tweaking an operating system isn't always easy, particularly when you are not sure whether the tweak you are applying will adversely affect your system or not. Just knowing which registry key to change can make the difference between having a PC that performs as it should, and one that refuses to even boot correctly. Wouldn't it be so much easier if someone else could do the tweaking for you, leaving you to get on with the more important things in life? Well, Totalidea software have done just that! TweakVI is an easy to use tweaking and performance application that really does take the sting out of tweaking Windows Vista. TweakVI opens to a rather stylish graphical interface with a feature bar menu on the left hand side of the main window. Click on any one of the feature bar options and a sub menu of available tweaks and enhancements appears. For example, should you click on the Miscellaneous tweaks feature bar the resulting sub menu will offer the following: Tweaks for changing system folders, mouse tweaks, media player tweaks and auto start settings. Of course these are just a few tweaks that are on offer. By looking more carefully at each menu option you will find a host of other useful tweaks and enhancements. 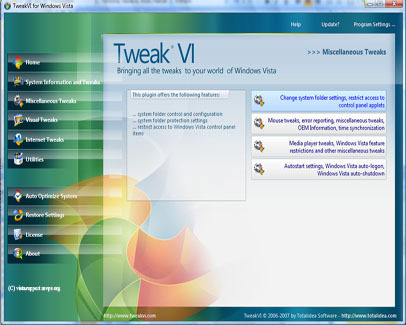 In order to accomplish tweaks and performance enhancements within the Windows Vista environment, TweakVI uses a series of 'plug-in' modules; these plug-ins being loaded by the system as and when they are needed. The number of available plug-ins varies depending upon the TweakVI edition you subscribe to. For this review we have used the Ultimate edition of TweakVI which currently supporting a total of 28 plug-ins. While it is convenient to move from one feature bar to another selecting individual tweaks and enhancements, for those users that don't want the trouble, TweakVI comes with an extremely useful Auto-Tweak option. This allows TweakVI to automatically tweak cosmetic, internet and networking, performance and Direct X settings. 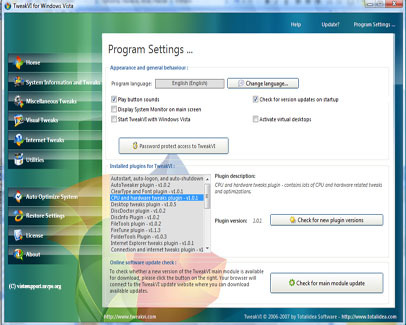 It should be noted, however, that while the auto tweak option is a God send, in order to increase performance TweakVI is likely to turn off many of the 'eye candy' features of Windows Vista. TweakVI is distributed in three editions - Free, Premium and Ultimate. Incidentally the TweakVI edition naming conventions have nothing to do with the version of Windows Vista you use on your PC. 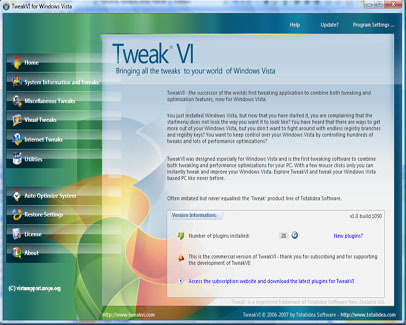 The Free, Premium and Ultimate editions of TweakVi can be used on any version of Windows Vista. As one would expect, the free version does have a number of restrictions. Physically, though, the interface of the free edition is the same as that of the Premium or Ultimate edition, the only exception being, in the free version, a number of the more advanced features have been disabled. TweakVI is easy to use and contains a host of tweaking features allowing the user to complete simple tasks such finding the Windows Vista product code number, removing the arrows from desktop icons or more complex activities such as tweaking and optimising internet connections. It even gives you the option to quickly and easily disable the User Account Control should you fine UAC a nuisance. At some time or other everyone attempts to tweak their system; with TweakVI you will find it so useful that, compared to other tweaking software, it is simply in a league of its own.